Can you even imagine a world without teachers? It’d be a whole lot dumber, that’s for sure — but teachers do SO much more than teach; they encourage, guide, and inspire, and we remember our favorite ones for the rest of our lives. They deserve to be thanked! Are you ready to learn how to write a perfect thank-you message to a teacher? 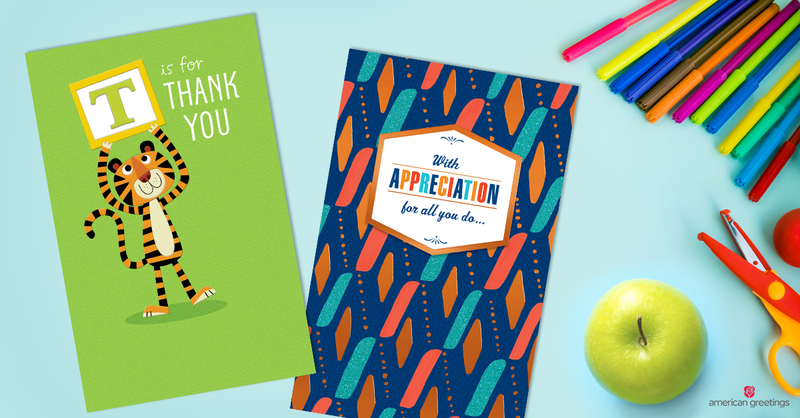 From daycare teachers to high school teachers, and every teacher in between, we’ll help you come up with just the right thank-you message for that awesome teacher in your life. Thank you for creating such a fun and educational environment for [Ellie]! When I leave [Isaac] with you every day, I know he’s safe and cared about — and I can’t tell you how much this means to me. All your hard work doesn’t go unnoticed – thank you. I’m sure you don’t hear this enough, but you’re a really great daycare/preschool teacher. Thanks for putting up with my kid! You are a gift to kindergarteners. And to parents. Thank you for all you do. You know that [Evy] likes monkeys and that she has [a baby brother] and a [dog named Applejack]. You took a shy little kindergartener and made her more confident. You are the best kind of teacher, and I can’t thank you enough. You have rock star status in our house, and [Nicky] can’t wait to get to kindergarten each day. Thanks for being so amazing. Thank you for understanding that kindergarteners need a lot of help and the parents sometimes need a lot of handholding, too. We appreciate you so much. [Jamal] never comes home without something exciting to tell about his day in kindergarten. Thank you for caring so much to make every day fun and inspiring. Elementary school teachers are notoriously overworked and underappreciated. They certainly aren’t in it for the money; they teach our children because they love teaching children. They appreciate watching our mini-humans grow and make discoveries. They’ll love being thanked, so consider using one of the following phrases in your thank-you note to an elementary teacher. We feel so lucky that [Ellie] got you for a teacher this year. We certainly hit the jackpot in the teacher department! We’ll remember you — your patience, your kindness, and your intelligence — forever. Thank you for teaching [Ellie] about so much more than math and reading. The real-life skills you’ve instilled in her will help her go far. Your positive attitude is contagious, and [Isaac] comes home in a good mood every day! I can’t believe how much [Isaac] is learning in your classroom. Thank you for making school so exciting for him! It’s no secret that teenagers are challenging. Being in the room with just one of them is enough to make some people wanna run for the hills — and high school teachers interact with dozens of teenagers every day, and somehow, they teach them about math and books and life in the process. If we don’t thank them ourselves, let’s encourage our children to thank them. We’ve included examples for what to write in a thank you card to a high school teacher below, from both students and parents. [Ellie] has come so far this year, thanks to your guidance and encouragement. Of all the teachers [Isaac] has had, you’re the one who shines the brightest. Thank you for giving [Isaac] the tools he needs to succeed! I’m so grateful for everything you’ve done for [Ellie] this year. You’re so much more than “just” a teacher. You’re my mentor and friend, and I’ll take your lessons with me wherever I go. You’re the best teacher I’ve ever had. You showed me how capable I am of achieving great things — and I’ll always be grateful to have had you for a teacher. Why can’t all teachers be as awesome as you?! You always make learning fun. If your kiddo is old enough to write, a thank-you note will be more special to their teacher if it comes directly from him or her. High-schoolers can probably write a sincere thank-you, especially with the guidance we’ve provided here. Maybe have your elementary-school child write a sweet, simple line, like, “You’re the best teacher ever!” He or she could possibly include a drawing,too — which is also a great addition to keep in mind if you’re writing a thank-you note to a daycare or preschool teacher. A sincere thank-you note is going to mean a million times more than another Best Teacher mug or box of chocolates (although I’m sure those things are appreciated, too! ), and with the tips and examples above, you’re well on your way to making any teacher feel amazing. Amanda Celis is a writer and photographer with a decade of experience in the social expressions industry. She’s a mother of two and a wife of one, and resides in Cleveland, Ohio.